Upamanyu Chatterjee once wrote a book titled The Mammaries of the Welfare State. If he visited Tamil Nadu today, he would be tempted to write another called The Alcoholic Mammaries of Tamil Nadu’s Welfare State. Tamil Nadu gives away more freebies to voters than any other state. Its dark secret is that these freebies are financed mainly by massive revenues from liquor sales. All liquor shops are run by TASMAC, a government monopoly, to maximize revenue. TASMAC makes additional money by leasing space to private bars within liquor shops. Liquor revenue has risen from Rs 2,800 crore in 2002-03 to Rs 30,000 crore today. To finance an ever-growing list of freebies, the state government has aggressively expanded the number of liquor shops, making access easy. These now open early in the morning, leading to stories of drunkenness before noon. In one sense this approach has succeeded: liquor revenues have boomed. But in another sense the strategy has failed. It has created a big backlash from women complaining of abuse and wasted household money. 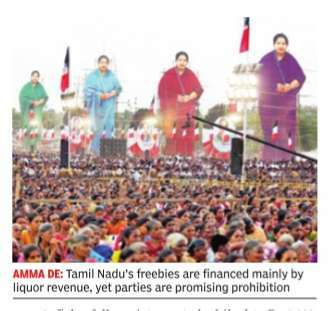 The DMK has blamed chief minister Jayalalithaa for encouraging drunks, and promised to impose prohibition if elected. Jayalalithaa in turn has accused the DMK of relaxing prohibition when it was in power, and proposed phased prohibition herself. Neither party can explain how the freebies will continue if there is no liquor revenue. The history of India is replete with examples of prohibition being introduced to win the female vote at elections, followed by a fiscal crisis caused by lack of liquor revenue, followed by a return to liquor sales. History will surely repeat itself in Tamil Nadu. It is by no means the only state where prohibition has become a major election issue. West Bengal and Kerala, two other states currently holding state elections, also have parties promising prohibition. They too have no convincing explanation of how liquor revenue will be replaced. But none has as long a list of freebies as Tamil Nadu, whose task is therefore most daunting. Jayalalithaa has just released her party manifesto. Her list of freebies includes: free cellphones for ration card holders; free laptops with internet connections for 10th and 12th class students; maternity assistance of Rs 18,000; maternity leave increased from six to nine months; one hundred free electricity units every two months; waiver of all farm loans (at a cost of Rs 40,000 crore); fisherfolk assistance to be hiked to Rs 5,000; women to get 50% subsidy to buy mopeds or scooters; an eight-gram gold coin for women getting married; a free Amma kit including sanitary napkins; and much more. Note that Jayalalithaa already provides 20 kilos of free rice per family, a free mixer-grinder and fan per family, subsidized Amma kitchens, and subsidized goats or cows for rural families. The state is reputed to be India’s best in delivering many government services, including education, health, MNREGA and the public distribution system. However, complaints of corruption are rising. Industrialists say this has been worsening for 15 years, eroding a once strong reputation for being a business-friendly state. One industrialist says that if you do not pay up, an army of inspectors will descend to harass you and threaten to close your establishment. An educationist complains that environment clearance is now required even for educational institutions, with the bribe for clearance fixed at so much per square foot of space. The sugar industry ran up enormous losses in recent years because state-advised cane prices were very high in relation to sugar prices. Modi’s rescue package for sugar mills in 2014 included raising the amount of alcohol to be blended with petrol from 5% to 10%, with the ethanol price rising from Rs 34.50 to Rs 48.50 per litre. But Jayalalithaa wants to maximize alcohol for liquor production. And so she has limited ethanol supply by sugar mills to oil companies to a trickle. The sugar mills are crying foul, in vain. She says she is industry-friendly, but is friendlier to the liquor industry than any other. That’s what produces the money for freebies. Elections in Tamil Nadu are rarely fought on policy issues. Both sides agree on a mixture of economic development and welfarism. Elections are contested mainly on the personal popularity of Jayalalithaa and Karunanidhi, and on competition in freebies. Using liquor revenue to improve basic state services like education and health is defensible. Using it for freebies is a political race between parties to the fiscal bottom. It can only end in tears.